"The most important growth influencing factor is light!" A hydroponic grow light is an electric lamp used to promote plant growth. It emits an electromagnetic spectrum used in photosynthesis, which is the process by which plants use light energy to collect carbon dioxide from the atmosphere and convert it to chemical energy. It emits a light spectrum similar to that from the sun, allowing indoor growth by simulating the outdoor conditions. Different stages of plant growth require the use of different light spectrums. Blue light for example is particularly important in the initial vegetative stage of plant growth, whereas red and orange light is used for the "flowering" stage later in the growth cycle. You can buy specific bulbs for each stage or use a full spectrum bulb which can be used for all stages of growth. There are combo kits that have switchable components/bulbs like the; MH and HPS 1000 watt system from Xtrasun. Fluorescent's put out a low level of light that does not burn or overstress fragile young plants. Fluorescent lighting can be used to grow your plants from seed to early vegetative-growth or from a cuttings to early vegetative-growth. Florescent lighting can also supplement natural sunlight or High Intensity Discharge (HID) lighting. The most widely used lights for professional indoor flower and vegetable growing are high pressure sodium (HPS) and metal halide (MH). These are types of high-intensity discharge (HID) lamps. The lighting system will include an electrical ballast to control the flow of electrical current to the light. This is required because high intensity light is necessary to emulate sunlight as close as possible. 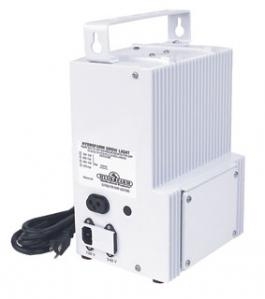 The Powerhouse 1000 watt Halide balast has many features which make it the most advanced HID ballast enclosure for a hydroponics grow lighting system on the market. It's contructed with a durable all-aluminum exterior and runs much quieter and cooler than any other Power House ballast. Cool components give higher performance and have a longer life. All of which is guaranteed with an 8 year warranty! Jump Start Grow Light System"
Buy hydroponics lighting supplies, find these items and more. Plants get all their energy from light. The larger the plant gets the more light it will require. Everything else; nutrients, water, air, climate is provided to help them use the light. If there is not enough light, a plant will not grow, regardless of other conditions. Beste's online hydroponics supply store - Visit our retail garden and growing center or call (586)776-1794 for the BEST prices and EaSy shopping.